About four months after I joined the Texas Rowing Center and their novice team, our coach, Saloni, started preparing us for the Texas State Championships to be held just four miles down the lake from our club. I signed up for four races, excited to try out my limited skill. In two of these events I would be in a solo boat, the races I was most looking forward to, because my performance would be completely in my hands. The other two races were in a four-person and an eight-person boat. Our team usually meets twice a week, but we moved that up to three times (Wednesdays, Saturdays, and Sundays) several weeks leading up to this event. One thing I really love about sharing a boat is the camaraderie we develop. These are friends I would seriously lend $100 to if they needed it. The reasons people join this club vary from getting back in the sport after a long layoff from collegiate competition to having a bad knee that keeps them from running to simply wanting to lose weight. Regardless of the reason, we are a tight group who have formed a strong bond. It is an amazing feeling when we are rowing in perfect synchronicity, placing the oar blades into the water, pulling the boat through the water, and releasing the blades out of the water to slide forward, catching more water, all in what seems like one machine. It is an extremely meditative experience, because if you let your mind drift, your performance will immediately show this loss of concentration, affecting the entire boat’s performance. This total focus has a way of shutting down a rambling mind and instilling a sense of peace. The day before this race, we all rowed boats down the lake to the venue and shuttled each other back in cars. My first event that day was in an 8-person boat with both male and female athletes (mixed 8+). We also had a cox whose job is to inspire, coach, and steer this massive boat. The nervous energy was high, but we had done our homework to get to this point and just needed to apply it. We gathered our oars, placing them next to the launching dock as many other teams were scrambling to get their oars and boats to and from this same point. Nerve-wracking to say the least, but we succeeded in walking our boat overhead through the safety check to the dock and locking our oars onto our boat. Stepping into the boat, we strapped our feet in and pushed off the dock, following the cox’s commands. We left early, so we had time to warm up properly for this upcoming “all-out” performance. The weather was beautiful, with slightly hot but not-too-windy conditions, so choppy waves would not be an excuse for bad blade work. The race promoters called our boat with four others to the starting podium, where each boat was backed up to a person who held the nose of the boat steady before launch. We sat in our boat with our oars in the water waiting for the “Go” command, only to have another boat make a false start, earning them a penalty. I guess they were even more nervous than we were. The race director raised his flag in the air, yelled “Attention!” and then whipped the flag down with a “Go!” We were off, getting a pretty good start. Our boat was a little wobbly from some ambitious rushing. A good start is very quick but not too powerful. The power is applied progressively over the first five strokes, then the stroke is lengthened with this power to grab even more water for further acceleration. The key to speed is smooth power. A choppy stroke will just upset the boat, causing the nose to dig into the water or tilt to one side, slowing it in the process. Our race boat started to run nice and smooth after this less-than-perfect start, allowing us to catch up to and pass one of our competitors. We still had another boat that was holding its second-place position firmly. We pulled as hard as we could, coming side-to-side. Surging ahead for a brief moment, then back to a tied position. Just as the 1000-meter finish line appeared, they slipped out of our grasp to take second place. We had bronze, so it did not feel like a total loss, especially since the boat that just beat us was the advanced team from our rowing club. Not too shabby for an up-and-coming novice crew. My next race of the day was in a four man boat (M4x). We hadn’t had too much practice together in this boat but were all in good physical condition and hungry to row. Pulling the boat into the water, we made it to the warm-up area near the starting line for some good warm-up drills. Backing the stern of this boat into the starting podium, we waited as the announcement of our club and rival teams could be heard over the intercom. The “Attention” command was given as we leaned forward with our oars, locking them into the water. The flag dropped with a “Go,” and we were off to a great start. We were up against four experienced boats, so we had our work cut out for us. Already ahead of two boats from the start and closing in on the third, we continued to pull the boat slowly but smoothly to their side. The red buoys became visible, indicating the last 200 meters of this 1000-meter race , so we really dug deep, nudging ahead of that third boat for a second-place win. My two last races in a single boat (1x) came after the four-man race (4x). My inexperience combined with my exhaustion reaped me no wins, but I held my own against some great athletes. I am looking forward to showing my increased skill level and stronger physical endurance next year. A couple of weeks after my solo journey on that freezing lake, I was at at a party hosted by the owner of our rowing center, Matt Knifton. I was speaking to a few people about that awesome dam-to-dam row when he overheard and said, “You’re that guy who was seen rowing on the lake!” He got excited and shook my hand. 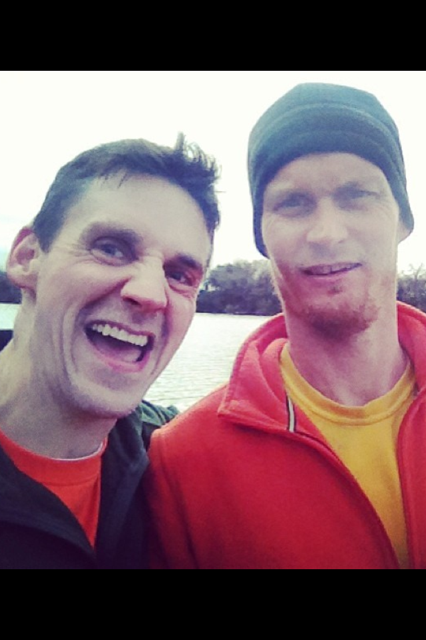 The conversation about crazy rowing stories came up, and Simon Borchelt joined in. We were enjoying a few alcoholic drinks as I mentioned to Simon my past ultra-marathons on land and desire to do the same thing on water. He immediately asked if I wanted to take a two-man boat out and do this. I gladly accepted, and two days later I confirmed that this agreement was not just the booze talking. We met that weekend at 8 a.m. with energy bars, fruit, and sports drinks. I decided to use gloves because of my limited skill level (experienced rowers have calluses built up to protect their hands and more precise gripping technique to further protect them). Simon is a far more accomplished rower, having sculled since childhood. His father, Mark, was on the U.S. Olympic team and now coaches the elite team at our club. Mark used to give Simon money for every mile he did on the indoor rower, so the motivation to succeed was well enforced. Simon and I pulled a boat out to the dock’s edge, and, with oars in place and food and water stored securely, we headed out. The weather started out nice, and there were not very many standup paddle boards, canoes, or other floating vehicles to navigate around. The water traffic can prove troublesome on the weekends, when the college kids and families are out in higher numbers. The combination of a sculling boat’s speed with the fact that we are rowing away from our visual path makes it necessary to constantly look back for obstacles that are in the way or headed into the boat’s path. We rowed to the first dam and turned back, passing the docks toward the other dam. This would be just the second time I had journeyed to this other dam. Simon and I had some funny conversations along the way, talking about ex-wives and places we have lived or visited. With this great company, reaching the second dam felt like a relatively short trip. Rounding the island and heading back to the dock (a 12-mile round trip), we hopped out of the boat to stretch and eat. After 15-20 minutes we headed out for lap two, reaching the first dam then back toward the other. My hands were already starting to feel raw under my gloves, but the rest of my body felt great. Simon was holding up well too. A few miles from the next dam turnaround, I discovered that Simon had only rowed one “dam-to-dam” distance before, so this was a new personal best for him as well. We reached the dam and headed back for another rest break on the dock, this time taking 20-25 minutes to recover before heading out for the victory lap. We were both still in high spirits, feeling just a little sore but ready to finish strong. We reached Tom Miller Dam (at Red Bud Trail) and turned back for our last meeting of the day with Longhorn Dam. The wind was starting to pick up, and my novice-level blade work was getting a bit sloppy, jerking the boat around at times. I pulled myself together as the wind increased the choppiness of the water surface, further testing my abilities. Simon was doing an excellent job of keeping the boat level, often correcting my blunders with a quick oar stroke. He was positioned ahead of me, so was able to give me great advice on my technique. I love surrounding myself with experts who test my abilities and teach me to improve. We made it back to the dock, finishing our 33-mile (36 miles on some water maps) adventure. Simon has since done this triple loop solo. Feeling much improved, I think I’m ready to try a solo quadruple loop. I’ll post it as soon as I do it!! Tired but happy to have completed the day’s challenge of a triple “dam-to-dam” row (33-36 miles). After passing on this race to do a rowing marathon that ended up getting canceled due to freezing temperatures, I discovered that the Run Like the Wind race had also been canceled. Searching online to update my bio, I discovered that this race was to be held in February, just three weeks away. I had done very little run training, so the mere idea of standing on my feet for 24 hours seemed daunting. There was a 12-hour option, which I had won two years ago, but the temptation to defend my 24-hour title was offsetting much of my fears. With just these three weeks before race day, I hit the road with my best running shoes to get a 5-, 8-, 12-, and 16-mile run in the days leading up to this. I am a firm believer in avoiding overtraining, so even with a few weeks to prepare, I needed to be fresh before this long event. Standing at the event sign-up table, I decided to go for the full 24-hour event. There were many who had signed up for the 3- and 6-hour times as well, so I would need to keep my ego in check, letting them pass me on this one-kilometer loop until their events timed out. Many would agree that the real race in an ultra is the last half, so pacing is crucial. With a total of eight runs under my belt since the prior year’s win and seven additional pounds of fat and muscle on my frame, this was going to be a challenge. Brenda Carey and Brian Acree joined me, doing the three-hour event. 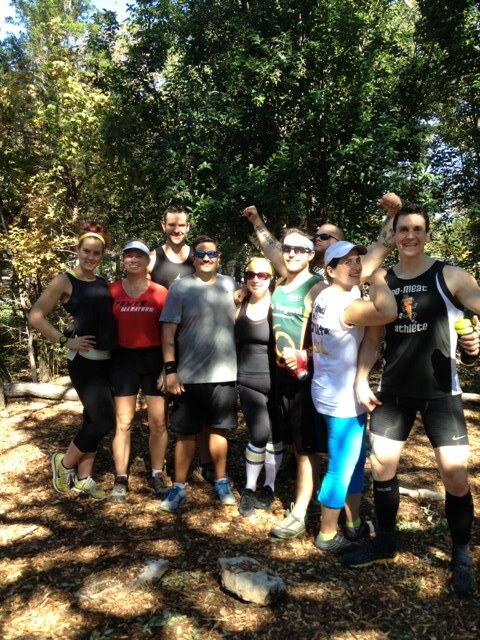 It was great to have these great friends to run with for the first quarter of the event. There were also some familiar faces from last year’s race here. I had my cooler loaded up with an electrolyte drink that would serve as my only form of sustenance for the next 24 hours. Solid food does not sit well in my stomach when running these events. There were 15 people signed up for this event, and many more opting for the shorter times, making this the biggest crowd in the last four years I have raced this course. 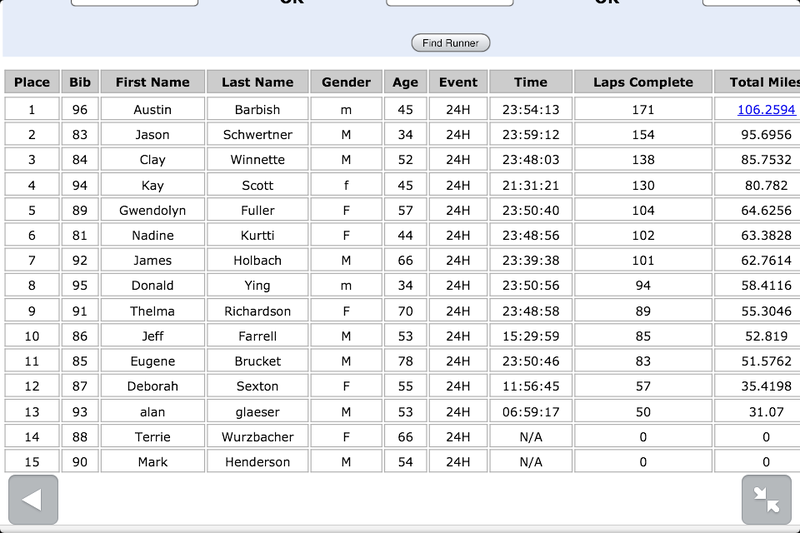 This is still a small race compared to the Rocky Raccoon 100 I have also done twice. That race has close to 750 athletes running either the 50- or 100-mile distance. the Run Like the Wind offers a more intimate setting, so great conversations frequently occur. I really love sharing stories during these longer races. I’m a social person, so a full day, turned night, then day again is a lonely prospect without good company. The race took off with a familiar cheer, and we all headed down the soft, mulch-covered trail–a surface that really saves your body’s joints by softening the jarring impact that a street race would impose. Brenda and Brian looked great as they cruised ahead while I tried my hardest to run a very easy pace. In an ultramarathon, most people, barring the elite, take walk breaks to conserve their energy resources. I include a brisk walk about one third of the time, stopping only to do a quick bottle fill-up. During a race I never wear a watch, preferring to run inside my body’s intuition but always staying aware to keep my body moving so my average pace does not dwindle from a longer break than absolutely necessary. Brenda and Brian had strong finishes to their three-hour mark, leaving me with just 18 hours to go. 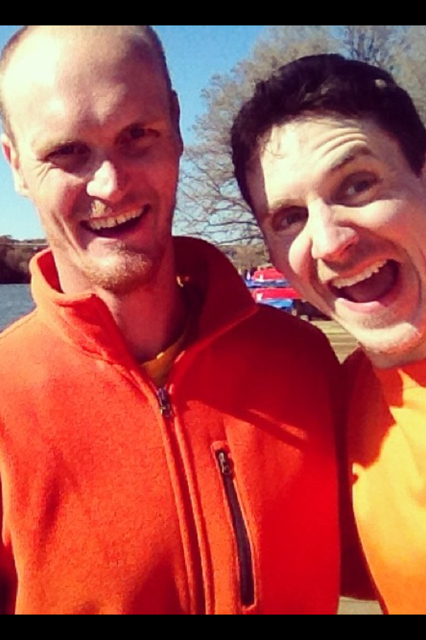 I met a great guy named Jason, who proved to be excellent company the remainder of the race. He was attempting the 24-hour too, and our running pace was similar, so hours passed by as we shared different topics of conversation. He consumed an almost completely plant-based diet, so my veganism, the problems with Monsanto, the cattle industry, and environmental pollution were deeply addressed. His father sold cattle for a living and wanted him to take over the business, so that moral dilemma came up as well. As the 12-hour mark came around, I was starting to feel my undertraining. I was in third place and kept an even pace despite the broken-down feeling that was creeping up on me. Jason was hurting, too, but holding first place. He had never completed an event longer than 100 kilometers (62 miles), so we had celebrated his success with a loud roar. I eventually passed the second-place athlete around the 70-mile mark and, soon after, Jason, as he was stopping to eat and rest his legs. I tend to stay strong in these longer events as others start to fade. I’m not sure if this is a mental or genetic advantage, but I’m honored to possess it. Jason’s goal was to pass the 100-mile mark by 10 a.m., when the clock ran out, so I cheered him on as I passed by. With an hour left on the clock, Jason showed a surge of energy, fighting to reach the 100-mile mark. It was truly amazing to see him come alive after such a reserved period. Brenda had showered and come back to the race to cheer me on and get photographs for Vegan Health and Fitness magazine. I was feeling sore but pretty strong, finishing with 171 laps (106.25 miles). This was not the 115 .32 miles from last year’s race, but considering the lack of training and extra body weight, I was stoked. Brenda took pictures, and the crowd, albeit small, were much appreciated with their cheers. Brenda has been such a great friend and supporter since the first time we met at the PlantBuilt show in July 2013. I have since been helping out this great publication with my photography skills, covering events from cooking shows and restaurants to health expos and races. It’s an honor to help this magazine with a talent that I, as a child through young adulthood, had envisioned as a career. Since turning vegan almost two years ago, I feel that working with her has instilled a stronger purpose and outlet to reach athletes considering a plant-based diet. Jason ended up with 154 (95.70 mile) laps. I really hope he returns next year to make the 100-mile mark, or even win. When the Run Like the Wind came around this year, I was eager, yet felt unconditioned for this long race. I had been concentrating more on weight training and rowing since this race’s December 2 cancellation (due to freezing temperatures). That date coincided with a rowing marathon I had opted to do as well. When I showed up to row this marathon at the 7 a.m. start time and realized it had been cancelled as well, I waited for a few minutes and then decided I was going to do a long row solo. Slipping into a tiny boat after finding good oars to attach, I stepped in, strapped in my feet, and pushed off the dock. It was still dark as I rowed about 1.5 miles to Red Bud Isle, where a dam hindered further exploration. I turned the boat and headed back toward the docks, passing them and journeying onward to the other end of this lake. There was a dam on the other end I had never visited. The sun started to rise, casting a beautiful golden hue that gradually replaced the deep blue darkness. Flowing under a few bridges, the lake took a gentle curve one way, then the other as I headed off into uncharted territory. I was still very aware that if this boat were to tip over, I would be in a bit of trouble as it was still 28 degrees outside. My feet were almost completely numb with just two pairs of socks, but no shoes. (The foot plates on these boats do not accommodate shoes, so cold conditions like these can be problematic.) I went under a few more bridges, realizing that I had not seen anybody else in the last six miles since starting this adventure except a lone jogger along a trail that hugged the lake. A few more miles of rowing revealed a split in the lake. I chose a direction, soon realizing that this was actually an island sitting in a large field of water. The lake had opened up into a vast, intimidating expanse. I felt tiny out there in this massive body of water. Rowing around along the perimeter, I saw what looked like another bridge, which revealed itself to be a dam by a powerful rumbling as it released water to its far side. Close proximity to the warning buoys of this massive structure produced images of being sucked through the power-generating impellers. I felt like it would be a good time to get out of there and head back to the docks. Looping around the other side of the island and into the narrowing lake brought me immediate comfort, and the four-mile journey back to the start felt like a celebration. My hands were a little blistered from my inexperience; relatively new to this sport, I had only four months under my belt at the time. There is so much to learn, but the progress is addictive. Following the curves and avoiding the large concrete bridge posts, I finally saw the docks come into view. I docked the boat, unstrapped my feet, stepped out, and stumbled onto the dock, realizing how tired my legs had become and how numb my feet were. This was not a marathon, but it was three times the distance I had yet traveled, leaving me extremely satisfied with eleven miles under my belt and a boat that did not flip over. I also had the lake to myself for the entire trip, giving me a dream date with nature that will never be forgotten. In the process of getting ready for the last three body building shows and the PowerMarathon event, I developed a shoulder issue: the ligaments that hold my left collar bone to my shoulder blade (AC joint) were tearing and needed time to heal. Looking around the gym for new exercises that would not irritate this injury, I spotted the rowing machine in the corner of the gym. I was already conditioned for leg pressing exercises, back rowing movements, and running, so the rowing machine seemed right up my alley. I sat on this machine, fiddled curiously with the electronic display, and started rowing. After trying a short distance of 500 meters and scratching the time down on a piece of paper, I hopped on the rower again a few days later, bettering my last time by several seconds. That night, searching “rowing machines” online, I came across the Concept 2 site. Not only was I using a Concept 2 machine, they also had an online database where people from all over the world could post their times! This is considered the machine of choice for collegiate and Olympic-level racers in the off-season all over the world for increasing stamina, so when I compared my 500-meter time and discovered I was second in Texas, I was stoked. Three days later, I became first. Attempting longer distances (1000, 2000, 5000, and 10,000 meters) yielded similar results. Now I was hooked. About a month after discovering this awesome piece of equipment, I wondered how rowing on the open water would feel and so decided to take lessons at the Texas Rowing Center. The center is just a 15-minute drive from my house to the beautiful Lady Bird Lake, where the docks are located. After a month of lessons, I joined the novice team and have been practicing two to three times a week. Hearing from an instructor about an indoor rowing event that would be held at the University of Texas in February, I signed up immediately. This event was called the Erg Rodeo, and it offered two flavors of pain–the 1000- and 2000-meter. I registered for both distances, even though they would be performed just 24 minutes apart. A few weeks later, I was on the university grounds at Gregory Gym signing in. The 1000-meter race was first, and I was up against five other contenders, two of whom were rowing coaches. The timer went off, and so did we. I got off to a fast start, almost too fast judging by the display on my machine that showed my pace. The display also showed the familiar distance shrinking with every surge of force applied to the handle: 900 . . . 850 . . . 800. By 350 meters, I was starting to feel the effects of the faster start. The burning sensation was in every tissue of my being as I gasped for air and asked my body to not give up. I screamed the last 100 meters out to the finish, folding over in my seat, desperate for the pain to recede. I thought I’d finished in third place when squinting at the overhead screen, so getting pats on the back felt like a kind gesture of good sportsmanship. Turns out that I was looking at the wrong virtual boat and that I had won by many seconds with a 3:08 time. I have come in second so many times in my bodybuilding past, so winning a 24-hour foot race, and now a rowing competition, really made me feel good, especially at 45 years of age. My performance in the 2000-meter race was quite poor, as I had nothing left in the tank and vomited immediately afterward in a garbage can hidden underneath a stairwell. I have continued to practice at my gym and improve on this winning time without losing my lunch. Can’t wait till next year. The PowerMarathon is a sport that had been on my mind since the late 90’s. In my mid-twenties, I decided to run a marathon. I was already a very ambitious weight lifter and so was carrying a heavier body than most of the serious racers. After a painful but rewarding finish in 4 hours and 3 minutes, the idea of combining the powerlifting I had been doing with this new hobby came to life. I mentioned this to a few friends at my gym and received the “you will run your muscle off” and “you have to be skinny to be a good runner” responses. Since 2007, I have been running and bodybuilding with good success, placing first or second in many of my competitions. After a Google search for this combined sport found nothing, I decided that life was too short to wait for things to be invented. 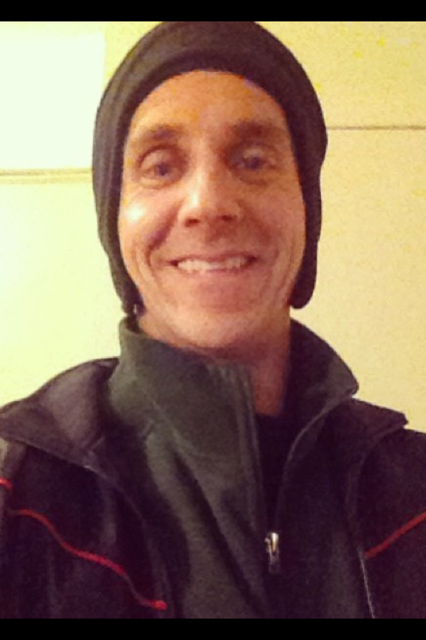 I set the date for the first-ever PowerMarathon for November 17, 2013, just one day before my 45th birthday. I had developed a great relationship with Brenda Carey and Brian Acree from Vegan Health and Fitness magazine, and Brenda was amazingly supportive in creating the layout and placing a one-page ad in the magazine. I needed to find a gym for the powerlifting portion of this sport, which would be done before the running challenge. Chad Beyers, owner of Beyond Fit gym in Austin, Texas, kindly offered his space for the event. He has a great gym and is a terrific guy–also a member of the PlantBuilt team of vegan competitors. 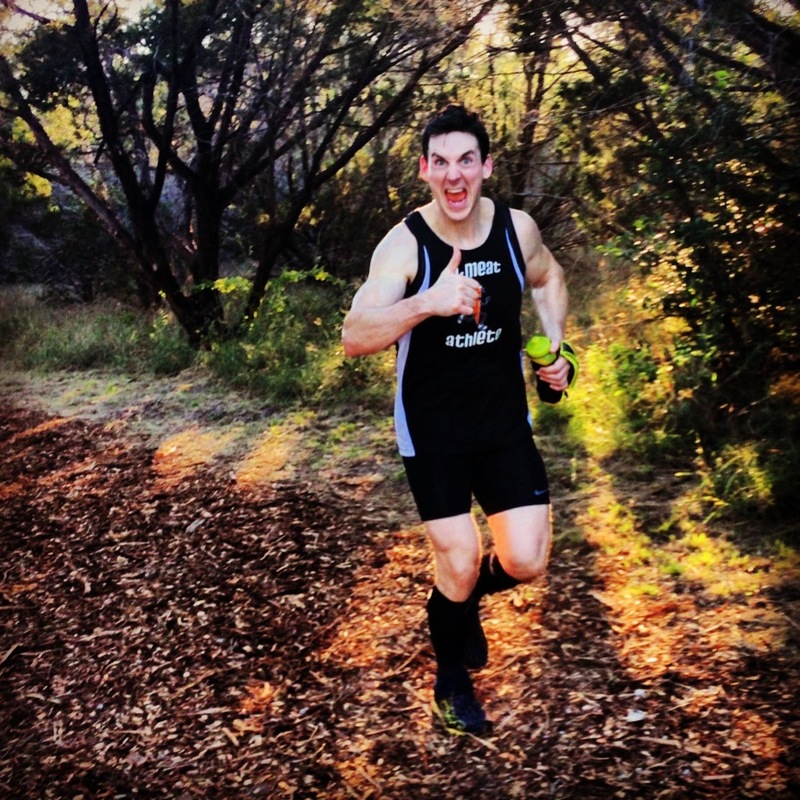 My second obstacle in getting this sport together was to find a place for the running element. The Shrodi Center for canine behavior has a one-kilometer loop used to teach dogs and their owners how to interact for a better relationship. This nonprofit foundation has done a terrific job accomplishing these goals. Every year they host a 3-,6-,12-, or 24-hour race to raise funds to support this cause. I have run this race four years in a row and love the soft, tree-shaded loop. The center graciously offered to let me use this course for the running portion. I was set! Now, I needed to do a little training myself. I did my powerlifting (squat, bench press, dead lift) on Mondays, Wednesdays, and Fridays, with two to three runs on alternate days. I rented a portable restroom that was going to be placed right next to the race loop and purchased two large coolers full of Gatorade and water. My good friend Pascal donated some sandwiches from his restaurant, and others supplied fresh fruit to top off our dietary needs. A trip to Home Depot to buy a large board to mark off laps and buying a rolling measure and boundary tape to mark the course finished the race preparations. I had already had the finishing medals made, so now just needed athletes to win them. A few weeks of Facebook advertising gave me the nice group needed. I wanted this race to be a controllable size, since this was my first attempt at coordinating an event like this. The day of the event came, and at 10 a.m. we all collected at Chad’s gym. I was concerned about re-injuring my lower back from contest training and so kept my squat at 315 pounds. The bench press was decent at 245 pounds, and the final lift, the dead lift, went well pulling 405 pounds off the ground. Between lifts, Chad, Trisha, Christy Morgan, and I spotted the other eight competitors and recorded their best lifts. When my lifts were completed, I rushed down to the race loop to remeasure the kilometer loop. The Shrodi Center had remulched the course the day before, accidentally breaking the tape used to mark the loop. This course has many optional turns, so it was fairly confusing to remeasure, but I finished marking the course again just as the competitors showed up. We laughed and took some pictures for a few minutes until the 12 p.m. race start. The clock hit noon, and we all headed down the course with a loud cheer. Elana Priestly and “Bone Breaker” Mike were both going for personal bests at longer distances, while John Savona was setting his goals to win the 10k distance. Spirits stayed high as we high-fived each other in passing. Christy Morgan was doing a great job keeping track of our progress by marking laps off on a big Masonite board that was resting in a folding chair. We were all sweating as the temperatures reached 90 degrees, a unusually hot day for November, even for Texas. Brenda Carey came in first in the 5k and others soon followed, cheering on the 10k runners and me from the comfort of a chair. John came in first in the 10k, and Elana broke a personal record at that distance. A few minutes later, I was the only one on the course, being the only one competing in the full marathon distance. (I was supposed to have two other marathon competitors, but they both had to cancel on short notice.) The others stayed for awhile longer, drinking, eating, and packing up their belongings. A hour later, I was the only one on the course, left to mark off my own laps on that board. It was a terrific feeling to be running alone, yet still in an event I had thought about creating so many years ago. It had been a long month of preparation, and these last laps were going to feel like victory laps. Brenda showed up with only three loops left to go, cheering me on as she caught the moment on camera to the finish. After a brief rest, she helped me break the course down, returning it to its original state and helping me load the chairs, coolers, and various other race goodies. Now, it was time for me to head home for a hot shower and a much-needed nap. Wow, it’s been quite the time since my last post. Much has happened. For starters, the all-vegan team I joined (PlantBuilt) took the Naturally Fit Super Show by storm, winning 2 pro cards and many second- and third-place trophies. Not bad for 15 vegans against 150 omnivores. I entered two divisions, placing second in both. 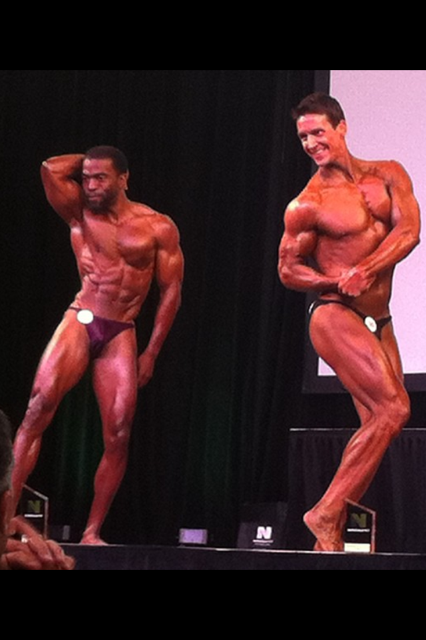 One of my team members, Will Tucker, beat out for first, with incredible conditioning and a huge chest. This team is made up of male and female bodybuilders and physique, bikini, and figure competitors from all over the United States. We gather once a year to show how competitive plant-based athletes can be without consuming any animal protein. The deeper purpose is to save the health of our fellow human beings by showing the health benefits of this diet, while lessening the cruelty our animal friends have to endure. In 2014, our PlantBuilt team will be more than twice the size, with 32 hungry vegans ready to once again dominate the stage in Austin, Texas!